The call came on Thanksgiving night two years ago. “Your house is on fire,” the police officer said. Nicole McManus immediately thought of her family: Her son, Aidan, was safe with his father, but her 6-year-old cats, Luna and Hermione, were in the burning home. When she reached the house, she learned that Luna hadn’t survived. A firefighter held Hermione, who was seriously injured. “Her ears and paws were burned and bleeding,” McManus says. A friend rushed the cat to Cummings School of Veterinary Medicine, where McManus found a community of skillful, compassionate veterinarians and others who would help her pet. Within minutes of arriving at the Foster Hospital for Small Animals, Hermione was in intensive care for third-degree burns to her paws, tail, ears, nose and cheeks; her tail had to be amputated. A team of seven emergency and critical-care veterinarians, two surgeons and a dermatologist managed the cat’s care around the clock. Despite her severe injuries, Hermione happily received belly rubs and dispensed purrs for everyone. After a few days, she was well enough to go home. McManus still had a tough road ahead. The Foster Hospital takes care of more than 28,000 pets every year. The hospital is such a lifeline for so many pets and their owners that Cummings School has launched a major renovation and expansion project so Tufts veterinarians can help even more animals. Anne and Travis Engen have been longtime benefactors of Cummings School. 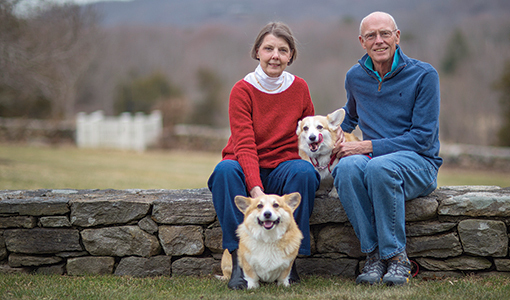 It is their way of recognizing the exceptional care Tufts veterinarians provided to their corgis, Belle and Dusty. In 2008, the couple honored the faculty clinicians who treated their dogs with a significant gift to support veterinary research and patient care. 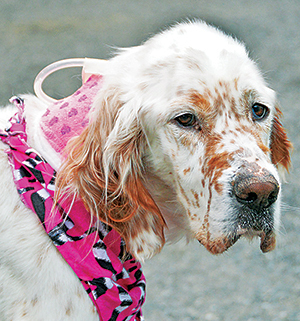 In 2009, after Dusty died of cancer, they made another generous gift to help the school establish a program in comparative oncology, which brings together veterinary and medical oncologists to advance understanding of cancer biology and to improve treatments of the disease in animals and humans. $5 million that needs to be secured by the end of the year to meet a matching challenge grant from the Amelia Peabody Charitable Fund. When the Foster Hospital opened in 1985, the patient caseload was expected to be 12,000 animals annually; that has grown by more than 133 percent over the past three decades. The renovation is important for providing the highest level of care to pets as well as for attracting the best students and faculty to Cummings School.